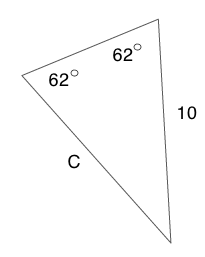 Are the two triangles shown congruent? For two triangles to be congruent they must have equal corresponding angles and sides. There are five geometric theorems that can be used to prove whether triangles are congruent or not. 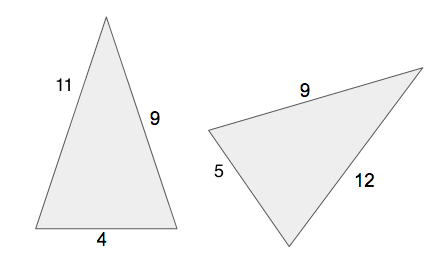 Since, these two triangles have two defined angles and the side between the angles are defined as well, the Angle, Side, Angle geometric theorem can be used. Looking at the triangles the corresponding angles are not equal and the correspond side is also not equal therefore, the triangles are not congruent. For two triangles to be congruent they must have equal corresponding angles and sides. There are five geometric theorems that can be used to prove whether triangles are congruent or not. 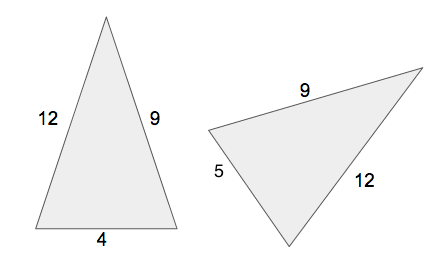 Since, these two triangles have all three sides defined, the Side, Side, Side geometric theorem can be used. 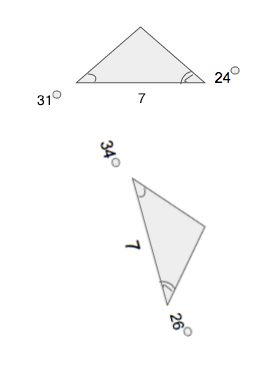 Looking at the triangles the corresponding sides are not equal therefore, the triangles are not congruent. 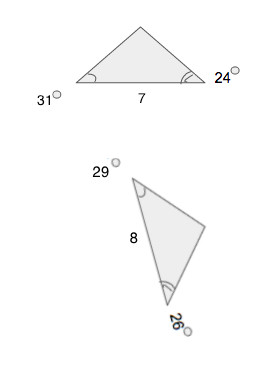 Looking at the triangles the corresponding angles are not equal therefore, the triangles are not congruent. 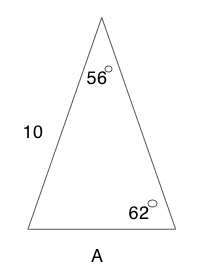 Are these two triangles congruent? For two triangles to be congruent they must have equal corresponding angles and sides. There are five geometric theorems that can be used to prove whether triangles are congruent or not. Since, these two triangles have two defined sides and one angle is also defined, the Side, Side, Angle geometric theorem can be used. Looking at the triangles the corresponding angle are equal and the correspond sides are also equal therefore, the triangles are congruent. 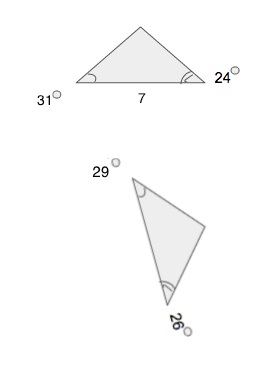 For two triangles to be congruent they must have equal corresponding angles and sides. There are five geometric theorems that can be used to prove whether triangles are congruent or not. Since, these two triangles have two defined angles and the side defined as well, the Angle, Angle, Side geometric theorem can be used. Looking at the triangles the corresponding angles are equal and the correspond side is also equal therefore, the triangles are congruent. What is known if is said to be a parallelogram? Opposite side lengths are parallel. All of the other answers are correct. A parallelogram is a special type of quadrilateral meaning, it is a shape that has four sides with opposite sides being parallel. Drawing the parallelogram can be done as follows. Therefore, all of the possible answer choices are correct. 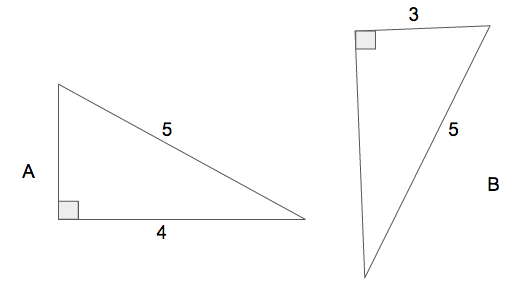 Which of the following helps prove an image is a parallelogram? A parallelogram is a special type of quadrilateral meaning, it is a shape that has four sides with opposite sides being parallel. Along with opposite sides being congruent, a parallelogram has two pairs of opposite angles that are congruent. Lastly, the diagonals of a parallelogram must bisect each other. Kettering University, Current Undergrad Student, Applied Mathematics. Madras university, Bachelor of Science, Biochemistry. Manipal University, Doctor of Science, Biochemistry.